Towable Tube 2-Rider Just $24.25! Down From $271! Shipped! 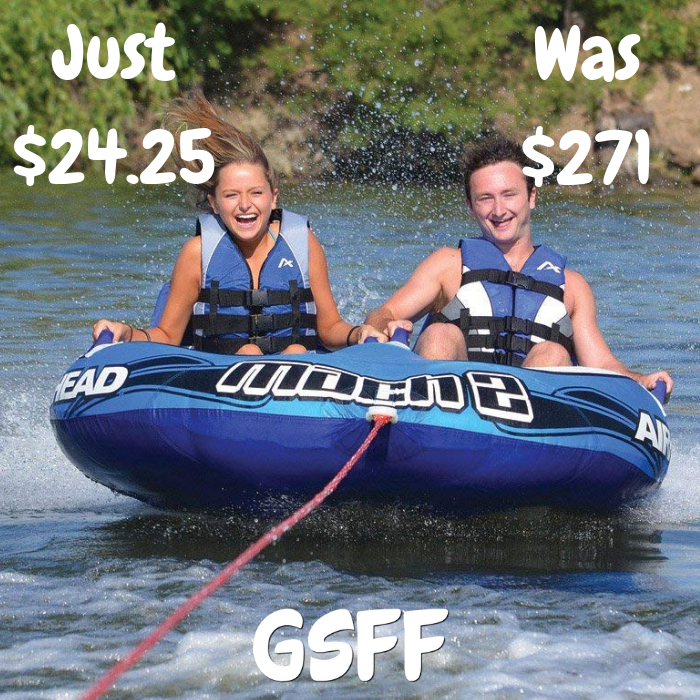 You are here: Home / Great Deals / Amazon Deals / Towable Tube 2-Rider Just $24.25! Down From $271! Shipped! Score this Towable Tube 2-Rider which is on sale at Amazon for just $24.25 down from $270.88 PLUS FREE shipping! MACH 2 is a budget minded 2 rider cockpit towable. It is a recommended cockpit tubes for timid and young riders, since they feel very secure inside. MACH 2 also has a wild side, making teens and adults happy too. The inflated floors provide a comfortable seat. Four deluxe handles with neoprene knuckle guards provide a secure and comfortable grip. The heavy gauge PVC bladder and durable double-stitched nylon cover ensure years of service. Equipped with a patented Speed Safety Valve for easy inflating and deflating.